Although the plan was scheduled to be released last fall, Lindsay said additional consultations were required to create a more accurate representation of the university’s needs. After drafting the plan, the Indigenous Directions Leadership Group presented it to various faculty and staff members including the president, dean of students, members of senate and chairs from multiple departments to have it approved and launched. According to the action plan, the administration plans to facilitate students’ self-identification as Inuit, First Nations, Métis or part of an international Indigenous community on their admissions applications by summer 2019. In addition, they hope to increase the number of scholarships for Indigenous students by fall 2019. Through the development of an Indigenous GradProSkills course by fall 2020, the plan wants to encourage Indigenous graduate students to become faculty members. The report also outlines plans to develop a policy regarding the use of Indigenous languages and terms in both internal and external communications at the university-level. 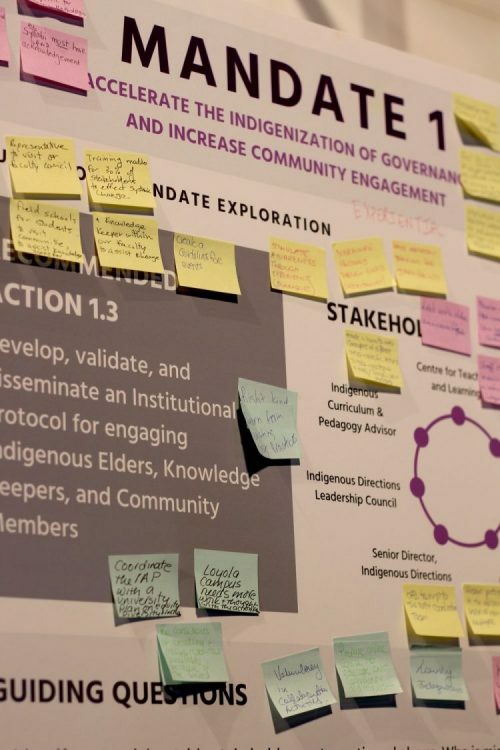 Heather Igloliorte, the special advisor to the provost on advancing Indigenous knowledge, said the consultation review focuses on achieving short-term goals and what is expected in the next three years. “It’s an ambitious plan, but it is achievable, because it is all steps that will set us up for future actions,” she said. Concordia is the leading university in Quebec working towards becoming a more Indigenous-inclusive institution, according to Lindsay. He hopes it will encourage other schools to implement a similar plan. “McGill is doing something similar, but I don’t think it is as comprehensive yet,” he said. Lindsay has done similar work during his time at Simon Fraser University. Igloliorte hopes to eventually see a graduate program for students who want to expand their knowledge beyond the undergraduate program. With files from Ian Down.